I have recently obtained the original records (LP's) of these recordings. They do not appear to be radio broadcasts afterall, but recorded direct to LP for sale. is 1970 & 1971. The Anvil tapes were produced in 1979.
produced & published by DISCOURSES, High Street, Tunbridge Wells, Kent. The following is written on the back sleeve of all four records. Ask anyone, anywhere, to tell you something about Sherlock Holmes and the odds are that you will get a ready answer. Celebrities come and go; the headline name of yesterday is forgotten today. Sherlock Holmes, defying time, the fickleness of the public, and the knowledge that he is a fictional creation, goes on forever. Each year several hundred letters reach London from all parts of the world intended for this man who never lived, at an address which never existed. Their contents range from facetious exhortations to Sherlock Holmes and Dr Watson to do something about a current crime, to genuine appeals for advice and even personal intervention in cases of dispute or distress. It is now the best part of a century since the first ever Sherlock Holmes adventure appeared, yet the stories in book form are selling in greater numbers than ever before. 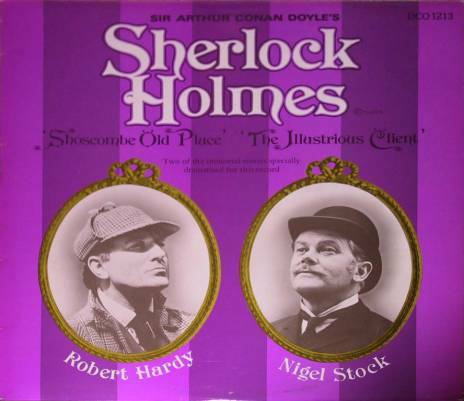 Film, radio and television versions abound and are as popular with young audiences as with their nostalgic elders, who tend to regards Holmes and Watson as fixed points in a changing, ultra-sophisticated age whose frenetic clangour might have expected to have blunted, our senses that such gentle, rather quaint stories could no longer excite or even divert us. Paradoxically, this is the explanation for the stories immortality for Sherlock Holmes's superiority over all other fictional detectives. First-rate storytelling aside, they are a compound of charm, subtle atmosphere, and the reflection of an age and a way of life, upon which we can gaze with deepening envy as each year passes. Historians and sociologists hasten to remind us that a romantic view of the late Victorian age must be sternly censored by awareness of the misery, degradation and vice which were widespread. "Emancipated from the bonds of fact" in Dr Johnson's phase, Holmes and Watson live in milieu which has been emancipated too: the jingle of hansom cab substituted for the roar of massed automobiles, the stench of carbon monoxide replaced by the sweet scent of horse, the modern pressure relaxed into a tranquil routine of leisured breakfast, half a dozen newspapers, a pot of coffee. "Ring for our boots", a stroll in Regent's Park, then back to lunch and any letters from the fifth and sixth delivery of the day, to find an anxious client with a bizarre tale that will take us by cab or train on some trilling trail. Millions of people have entered this world and shared these experiences through the mediumship of Sherlock Holmes and the great storyteller and man who created him, Sir Arthur Conan Doyle. as Dr John H Watson. The following are the known recordings, giving the Anvil Cassette reference.